While there is little that can be done to ease the pain for someone who has recently lost a loved one, sympathy flowers are a longstanding tradition in many parts of the world as a demonstration of condolences. Funeral flowers add beauty, fragrance, and color to an otherwise somber occasion, and 99% of people who receive flowers believe that the giver is a thoughtful person. At the same time, there are certain rules of etiquette that come with sending sympathy flowers. 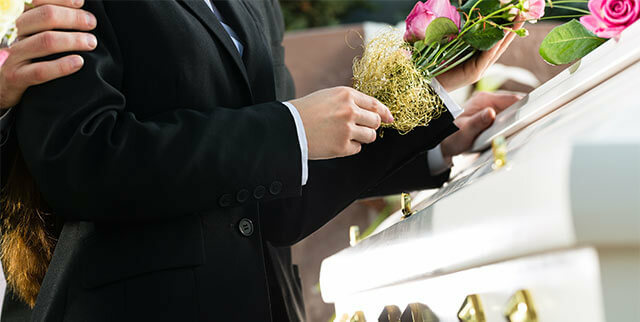 Read on to learn more about how to choose an appropriate floral arrangement as a show of bereavement. The type of flower arrangement you choose will depend on where you are having the flowers delivered. In most cases, large, standing arrangements can be sent directly from florist shops to funeral homes where the services are taking place. If you are sending flowers directly to a person’s home, opt for smaller flower bouquets. Any type of flower is appropriate for sympathy and funeral pieces, so long as they are tastefully arranged by a florist. Some flowers do carry certain meanings, however; white lilies for innocence, pink carnations for remembrance, red tulips for love. While many people choose subdued colors for sympathy flower arrangements, bright and lively spring bouquets can also serve as a celebration of the deceased’s life. Putting your feelings into a few words can feel difficult. Most sympathy or funeral flower cards will simply read, “Deepest sympathies,” “With love and sympathy,” or, “Our thoughts are with you.” Be sure to include the first and last name of everyone who contributed to the flowers on the card — within reason. There is no wrong time to send sympathy flowers to a grieving family. Even if you only found out about the news after funeral services have already taken place, you can still send a thoughtful arrangement to the family’s home, no matter how much time has passed. When in doubt about the appropriate actions and steps to take with sending funeral or sympathy flowers, talk to the local florists. They will be familiar with local traditions, as well as any preferred color patterns for the service itself. The important part is to express your sympathy in whatever way you can. Same day delivery on most orders received by 11, local funeral homes by 2pm. We offer daily delivery to over 100 zip codes including: Dundalk, Essex, Middle River, Perry Hall, White Marsh, Rosedale and Baltimore. © 2018 Essex Florist & Greenhouses, Inc. All rights reserved.